Fibromyalgia, chronic tiredness, multiple headaches, cervicalgie, pains, problems of concentration, giddinesses, sleep disorders, feeling of oppression, disorders of heart rate, disorders neurodegenerative, orphan depressions, diseases… These diseases, increasingly frequent, waste the life of hundreds of thousands of our fellow-citizens. 1,800 scientific publications highlight the effect of the electromagnetic waves on the human being and the animal world. It is not any more any doubt today that the electromagnetic “smog” of which we are wrapped, as the photonic effect of the matters which we carry (prostheses, clothing, etc), have heavy responsibility in a large number of these disorders for health. The operation of any living organism is electric and magnetic and necessarily interacts with its environment. The wave orders with the particle, and consequently with chemistry. 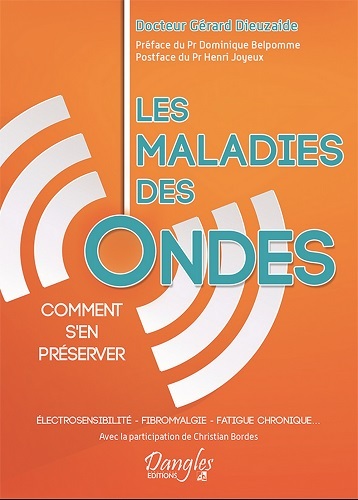 Gérard Dieuzaide identifies, in this at the same time practical work and very documented, the various sources of electromagnetic disturbances, their consequences on our health, and suggests concrete solutions to protect himself some effectively. Its protocol of detection of the electromagnetic incompatibilities is a true natural treatment of the fibromyalgia for those whose cause is of this origin. Doctor Gerard DIEUZAIDE is dental surgeon, university degree of posturology, honorary president founder of the “interdisciplinary Company of posturology Midi-Pyrenees” and chair of “the European Institute of posturology”, author of the book “Release you from these parasitic matters” to the Trédaniel Editions. He contributed to the documentary sacrificed waves of the director Jean-Yves Bilien. Christian BORDER took part in the chapter “To tame the waves”. He is osteopath and kinesitherapist, director of the IUMAB (International Union of Medical and Applied Bioelectrography), specialist in the electro-sensitivity, ex-charged with course to the university Paul Sabatier of Toulouse, independent researcher on electromagnetic compatibilities (CEM – Formation CRIIREM), scientific spokesperson of associations of victims of the waves, lecturer and trainer. Foreword of Pr Dominique Belpomme and postface of Pr Henri Joyeux.